Okehazama Park (桶狭間公園) is located on the legendary place of the battle of Okehazama. Legend said, the battle of Okehazama took place at this park. 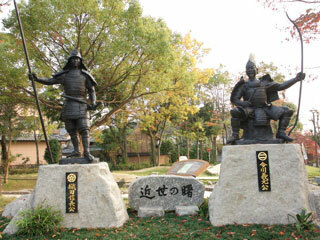 There are statues of Oda Nobunaga and Imagawa Yoshimoto. The pond and artificial river represent small scale of the map of the battle of Okehazama. There is a restroom, but no parking. The battle of Okehazama was one of the most important events in the history of Japan. Oda Nobunaga, feudal lord of Owari, defeated Imagawa Yoshimoto, a lord of Suruga, Totoumi and Mikawa and his 25,000 army, with 2,000 elite troops. After this battle, Nobunaga started to rule over the whole country of Japan. This battle was done around the Okehazama hill and Imagawa Yoshimoto was killed at this place which used to be called Dengaku-tsubo, where the Okehazama Park is located.